Figure 1 (left). A wheat field with extensive yellowing due to stripe rust in Kimball County on June 10. Some fields in this county had both stripe rust and wheat streak mosaic virus. Figure 2. 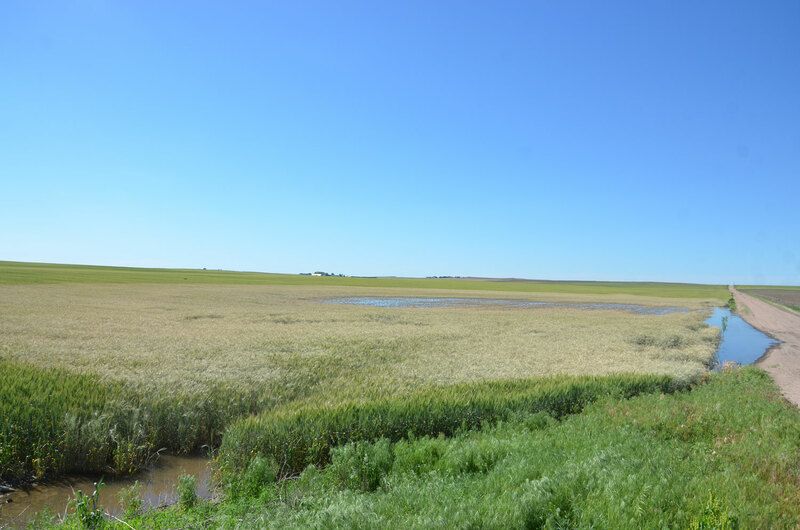 Flood damage to wheat in Chase County on June 9. Figure 3. Leaf rust on a stripe-rust resistant wheat line in a state variety trial in Furnas County on June 9. Figure 4. Stunting and lateral (instead of upright) growth of tillers of a wheat plant infected with wheat streak mosaic virus in a grower's field in Kimball County on June 10. 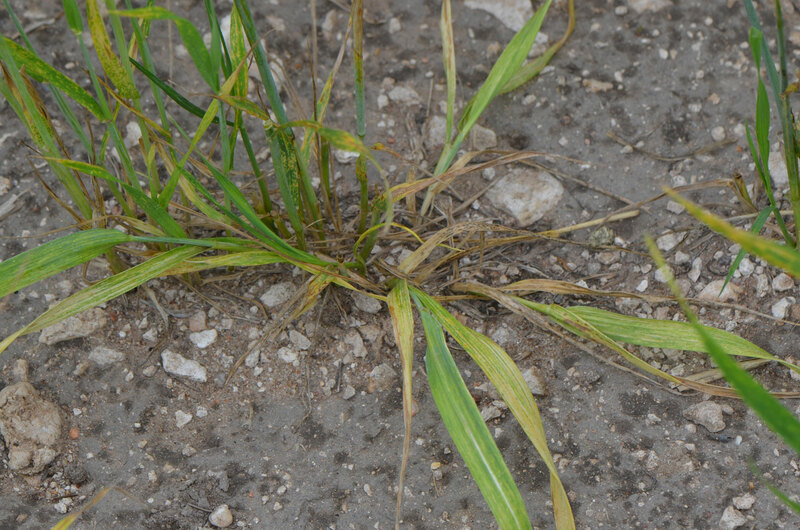 A low percentage of wheat streak-infected plants show this symptom. The rest are usually stunted and upright with a yellow-green mosaic on the leaves. 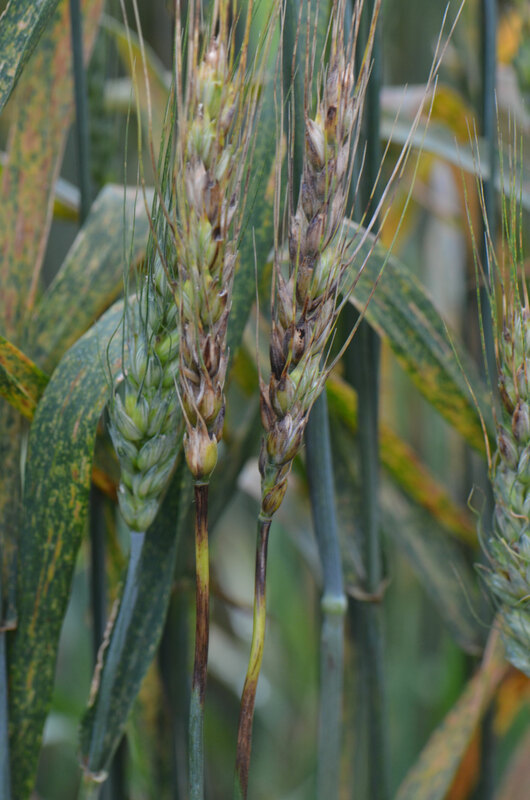 A survey of wheat fields and state wheat variety trials June 9 to June 11 showed a wide range of disease symptoms and disorders in wheat, ranging from extensive yellowing of wheat fields due to stripe rust (Figure 1) to flood damage (Figure 2). In a state variety trial in Furnas County, a few lines and varieties with good resistance to stripe rust showed high susceptibility to leaf rust (Figure 3). At this location only lines or varieties with resistance to stripe rust had green leaves. There was a low to moderate level of Fusarium head blight in the state variety trial and the wheat variety planted in the rest of the field. In the state variety trials in Hitchcock, Chase, and Keith counties, some wheat lines and varieties still had green leaves with actively sporulating stripe rust pustules. Leaves on highly susceptible lines and varieties were mostly yellow or dead. In addition to stripe rust, some growers' fields in Kimball County had wheat streak mosaic virus (Figure 4). 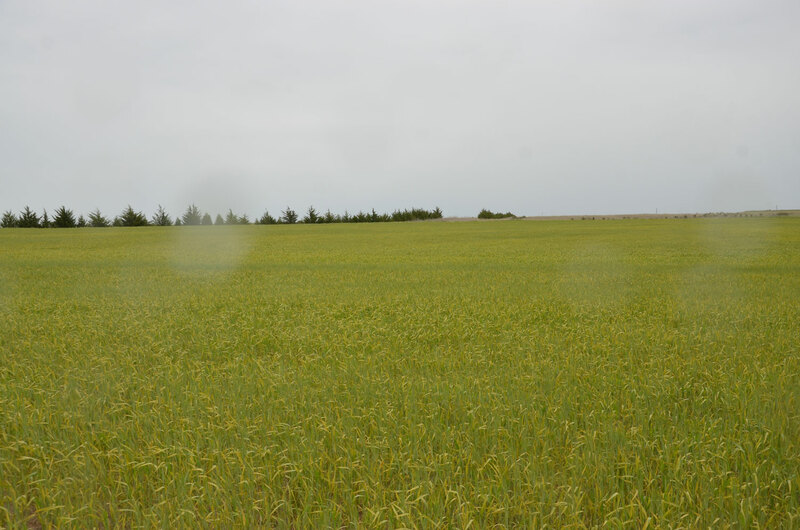 The combination of stripe rust and wheat streak mosaic exacerbated yellowing in these fields (Figure 1). On June 11 at the Agricultural Research and Development Center near Mead, Fusarium head blight incidence (percentage of diseased heads, Figure 5) and severity (percentage of diseased spikelets on a head) had increased dramatically from a week before. This was evident both in the state variety trial and research plots. The incidence and severity of black chaff (Figure 6), a bacterial disease, had also significantly increased at this location. Figure 5. 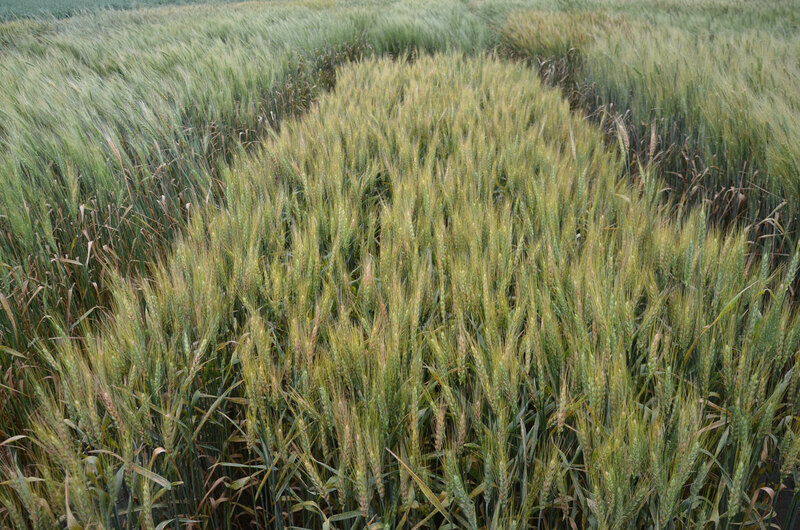 (left) A high incidence of Fusarium head blight in a wheat line in a state variety trial at the ARDC on June 11. Figure 6. Black chaff on wheat heads and stems of a susceptible variety at the ARDC on June 11. In the majority of the wheat growing areas in the state, wheat is well past the flowering growth stage. In these areas, a fungicide spray to control stripe rust is not recommended. This will ensure compliance with pre-harvest interval restrictions. In areas where wheat is in the early stages of flowering, if less than 50% of the flag leaf is free of stripe rust and the yield potential is over 40 bu/acre, spraying a fungicide to control stripe rust can be beneficial. Fungicides recommended for spraying after the beginning of flowering are Caramba and Prosaro. They are excellent in controlling stripe rust and have good efficacy on Fusarium head blight. Wheat streak mosaic and black chaff cannot be controlled once they occur. The best management strategy for wheat streak mosaic is controlling volunteer wheat and grassy weeds, on which the wheat curl mite vector survives, before planting in the fall.